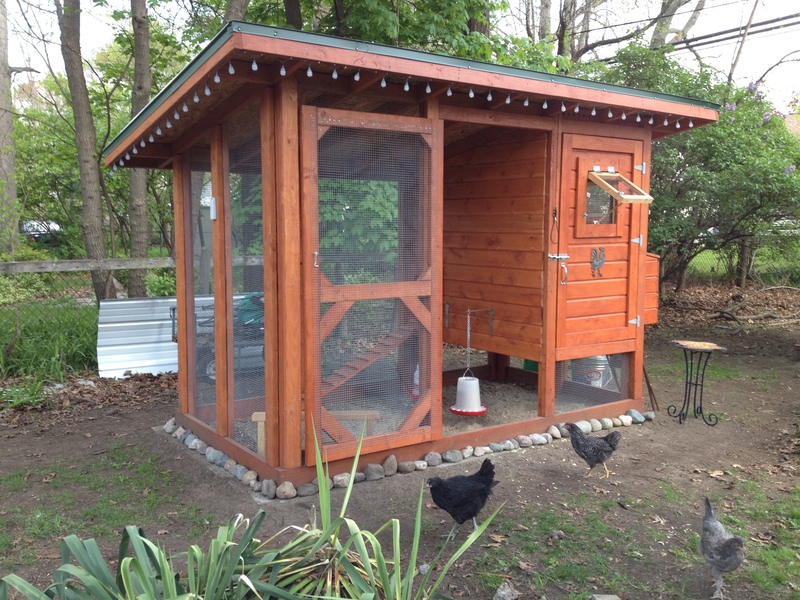 This week we added stones to border the base of the coop. How easy is it to take care of chickens, you ask? What I know for sure is that the hard part came before the chicks even arrived. It took us four months to build the chicken coop through blizzards, sub-freezing temperatures and rainfall. But once those little balls of fuzz arrived, we hit easy street. Loretta eyes the feeder. Time to eat! 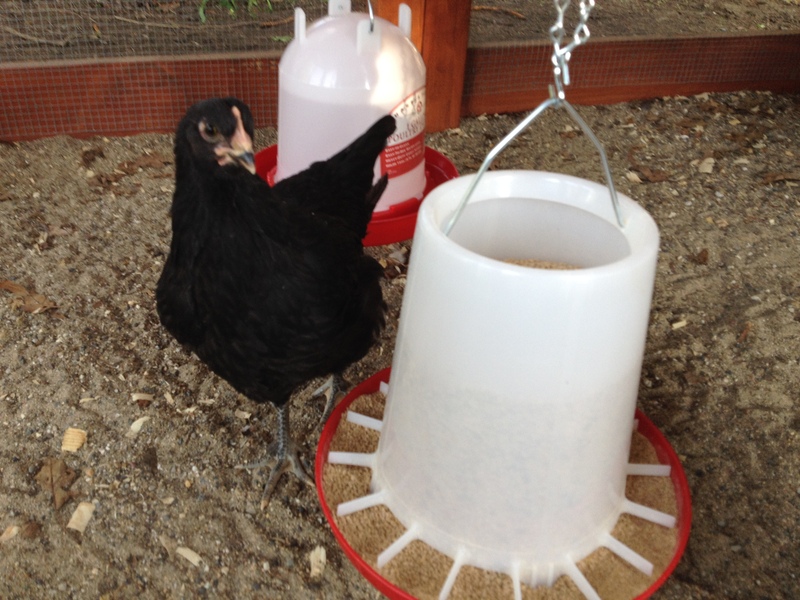 Now that the girls are settled into the coop, we have a simple routine. Next, I open the little chicken door that connects the hen house to the run. Usually Gigi, Loretta and Nellie already are awake, and clucking blindly at the door. Once the door opens, all three literally fly out into the run, or tumble down the ramp. First stop is the feeder, then they gulp down beakfuls of water. At this point, they are set for the day. When I get home, I like to let them roam the yard while I unwind from work. I watch as they forage under the yucca bushes, and chase each other once a worm is discovered. Incredibly our dog Charlie and cat Cora are nonplussed from all this action. They seem to understand the girls are family. At sundown, the chickens seem to have an internal alarm that tells them it’s time for bed. As dusk settles upon the yard, one chicken will walk up the ramp, then the other two will follow. Quite often, they already are snuggled up on a perch before I even open the coop door. Next, I close the guillotine chicken door, put the feeder back into the metal pail and make sure all the doors and windows are locked up. I also check water levels, and wash out and refill the gallon-waterer every two-to-three days. I have to say I dreaded the early morning routine before the chicks even arrived. Anyone who knows me, knows I am not a morning person. But magically, the first day I had to set my alarm at the crack of dawn, I got up and took care of the morning chores. Some days are better than others. I always make it out by 6:30 a.m., but I’m also (sometimes) back in bed by 6:34 a.m. While the chickens have to eat, a girl’s got to sleep! Judging from the soiled bedding that was removed, you can see where the girls prefer to perch. The birds also require weekly chores, mostly involving poop collection. Every Saturday, I open up the hen house, and scoop out the soiled litter. Since the birds mostly spend their time in there perching, their droppings fall in one area, making cleanup easy. 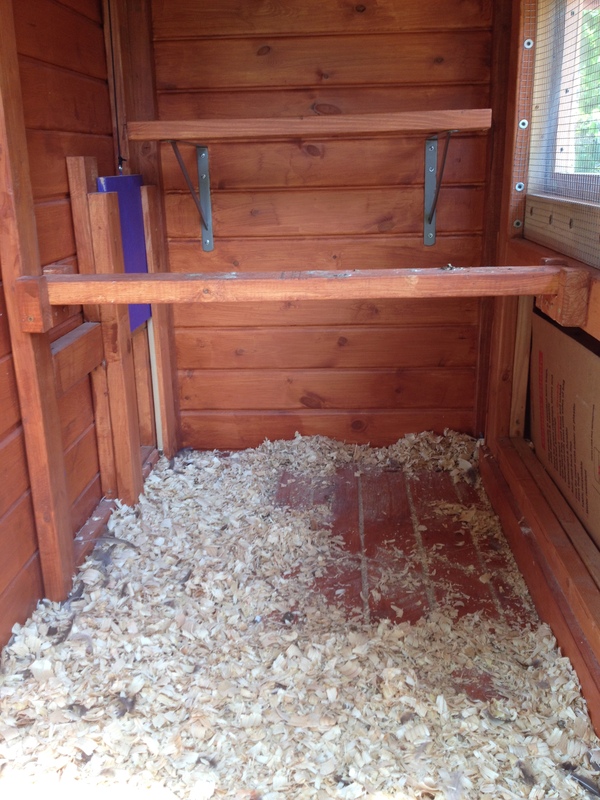 Once a month, I empty all the bedding, and put in a fresh layer of pine shavings. During the week, I will spot-check for droppings in the run. I’ll use my new Stand-n-Scoop to sift through the sand, and keep the run clean. In all, I’d say my morning chores take about 4 minutes (I’m not kidding!) and putting everything away in the evening, about the same. As for the weekly clean out, I’d say that takes about 15 minutes, between scooping, walking the droppings over to the compost and spreading new bedding in the hen house. And there you have it. The daily grind, at its finest. More than you’d ever believe.